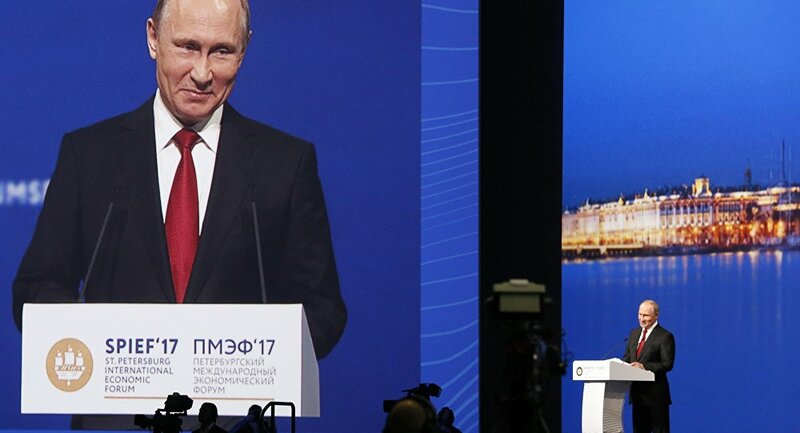 The St. Petersburg International Economic Forums (SPIEF) have long become a place where attending politicians and businessmen famously show their sense of humor cracking jokes and coining catch phrases that quickly go viral on the internet. 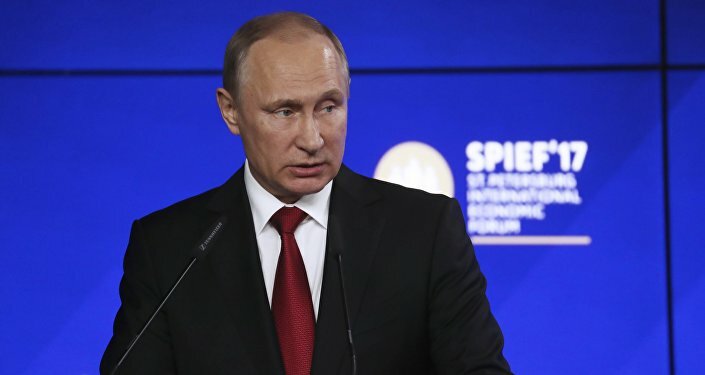 This year’s SPIEF was no exception, with President Vladimir Putin drawing laughs when, attending the forum’s plenary session on Friday, he jokingly told the participants who stood up to greet him, to stand at ease and relax. When opening Friday’s plenary session, its moderator, NBC anchor Megyn Kelly, asked Putin how come a mere one percent of Russians own over 70 percent of the country’s wealth. Despite the fact that Kelly drew no comparisons with the situation with social inequality in the US, where Democratic presidential candidate Bernie Sanders spoke over and over again about one percent of Americans owning 90 percent of America’s national wealth. Putin still told her that the Russian government was working on this and was prepared to offer more social benefits to those in need. He joked that if Megyn Kelly and her three children lived in Russia she would be eligible for maternity capital. Maternity (family) capital is a method of state support to Russian families to which a second or a third child or more was born or adopted in the period from 2007 till 2016. Since January 1, 2015, the allowance amounts to 453,000 rubles (just over $8,000). When asked about the US withdrawal from the Paris Agreement on climate change, Putin forced another chuckle from the crowd when he complained that European leaders do not regard him as one of their own. “In any case, they don’t think so,” Putin said, responding to Kelly’s words about the European leaders’ quick response to President Donald Trump’s decision to walk away from the Paris deal. Putin joked that Russia should be thankful to Trump as now he could be blamed even for bad weather in Moscow. "We should be grateful to President Trump. I know that it has been snowing in Moscow; it's raining here [in St. Petersburg], it's very cold. Now we can put everything off on him [Trump] and the American imperialism. But we won't do that," Putin added. — Петрович® (@Petrovichmos) 2 июня 2017 г.
Putin’s tone changed when Megyn Kelly started asking questions about Russia’s alleged meddling in the US presidential election. He said the suspicions about the Democratic Party’s “manipulations” during last year’s US election were well grounded and that the resignation of Hillary Clinton’s campaign manager only proved it. “Is this misinformation? This information is true, no matter where it came from. They should have apologized to the people before stepping down and promise that such mistakes would never happen again. <…> It was not Russians who pushed for one Democratic candidate at the expense of the other. It was not us, it was them who did this. Just stop it,” Putin emphasized. As Megyn Kelly kept asking questions about Russia’s alleged role, Putin invited everyone to learn a lesson or two from US journalists. “Here is Megyn who is a shining example of what high-class journalism is all about,” he quipped. The tension mounted further after Kelly noted that she thought that Trump said that Russia could have conducted cyberattacks on his opponents, but that he didn’t think it would do it again. “She thinks [so]. Listen, these are very serious matters of global politics we are talking about <…> It’s not just about taking an interview or penning a story for some newspaper,” Putin added. Putin believes that Donald Trump was elected simply because his team was better prepared and worked more efficiently during the campaign period and that Russia had nothing to do with that. “Sometimes I thought that the guy [Trump] was going too far. I was wrong. He turned out to be right because he found a way to reach out to the social groups he counted on and they came forward and voted him in. And the opposite team lost out, but they refuse to admit this mistake, that they simply failed to do it right,” Putin said. He urged the US media to stop interfering in Russia’s domestic affairs. “Just look at what your colleagues are doing here. They are all over us and doing what they want, enjoying themselves. <…> This is a systematic and unceremonious meddling in our domestic affairs. This has to stop.” Putin emphasized. Putin joked that despite the fact that Russia "doesn't feel" the effect of global warming as it has been snowing in Moscow today and raining in St. Petersburg, the Paris climate accord is a "good deal." He continued the joke by saying that Russia should be thankful to Trump as now he could be blamed even for bad weather in Moscow. He said that Russia has yet to ratify the agreement, adding that Moscow is waiting for the rules on resource allocation to be formed as part of the deal. Putin warned against making a fuss over the US exit from the Paris deal and urged to establish conditions for joint work. He added that the agreement comes into force in 2021, adding that there's still time. "Don't worry, be happy," he concluded. Putin was equally ironic in his response to Megyn Kelly’s clumsy attempt to gauge Indian Prime Minister Narendra Modi’s opinion about Russia’s possible state-level interference in other countries’ affairs. “You are talking about America, Germany, Russia, Trump, Hillary Clinton and Chancellor Merkel, but I don’t think that the situation calls for the presence of a judge or a lawyer like myself,” Modi replied. “The Indians are smart people. Ancient philosophy. So different from us, simple folks, who always say just what we think,” Putin noted. Ending the plenary session with another joke, Putin noted that Kelly was proof that the multipolar world had not materialized. “We are sitting here discussing many problems. A representative of India, one of the world’s biggest countries, and of Russia, which also matters somewhat. [We have] representatives of the EU and of Moldova, a small post-Soviet country, which means that all regions are present here,” Putin said. “Mr. Dodon said that the world has stopped being unipolar. But an American woman sits and commands all and I’m the last to get the floor,” Putin smiled thanking moderator Megyn Kelly for her good job.